Play Battle for Donetsk now! 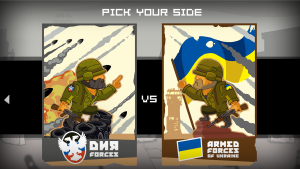 Battle for Donetsk, created by proud FLEGA member LuGus Studios, is a remarkable mobile game about the conflict in eastern Ukraine. The game starts off by letting players choose sides: they can play as the pro-Russian Ukrainian rebels or the government forces. What follows is an all-out military battle with a lot of violence and bloodshed. The big twist is that even if the player manages to win the strategic battle, he or she is inevitably confronted with a ‘game over’ screen that lists the high number of civilian casualties. LuGus Studios does not wish to take a political stance or condone violence and conflict in any way with its game. On the contrary, it strongly believes that games can raise awareness and educate players on important political issues as well as other mediums like websites, television, radio and social media. Battle for Donetsk is a free game. You can download it for Android devices on the Google Play store now or play the game in your browser on the game’s website. UPDATE! This game went viral in no time and merely half a day after release Battle for Donetsk amassed more than 15.000 players. Congrats to LuGus!